One of the most influential comedians of our time has been Scott Thompson with his work on The Kids in the Hall, the pioneering sketch comedy show where five friends every week crossdressed into outrageous characters; and his creation of Buddy Cole, the acid tongued gay socialite who can get away with saying anything. 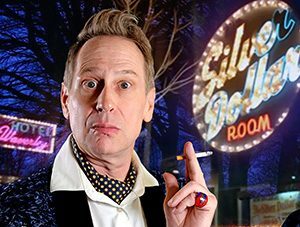 Today comedian Scott Thompson joins us to talk about his iconic character, the re-release of Budy Cole’s biography ‘Buddy Babylon’ and his new hit show Après Le Déluge (After the Flood): The Buddy Cole Monologues. Comedy Central daytime in the summer would play nothing but KITH reruns in the late 90s! This shows and especially Buddy Cole were fundamental to a generation of gay kids who had had no access to fags and drag queens!